These Skinny Moto Pants by EDYSON are block-pieced from a sleek coated fabric. It creates a cool ombré effect. The zipper detail on the knee and the ankle really add a taste of interest. You’ll have an awesome time partying in these figure-hugging pants. These Acid Wash Skinny Jeans from Love 21 features zip cuffs, five-pocket construction and are lightweight. These will look awesome with most tops in your closet. 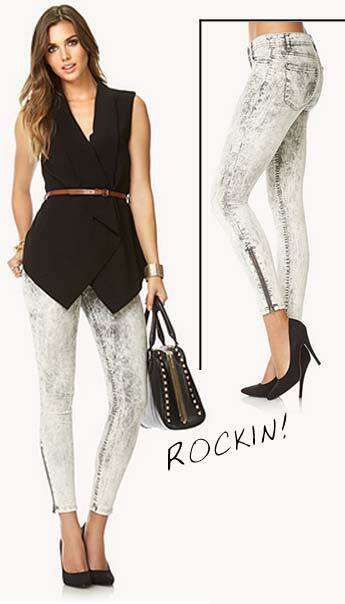 These jeans simply ROCK! These City Lights Skinny Jeans will light your world on fire. These wicked cool black skinnies have a high waist and blurred city lights print. Front and back pockets, button/zip closure. Stretch fabric. Looks super fun with a crop tank and mirrored shades.